On his way to 700 Home Runs and beyond, Barry Bonds set some of the most impressive and lasting long ball records the MLB may ever seen. During a 90-game span in 2001, Barry Bonds rode one of the hottest streaks in MLB history, slugging an unfathomable 40 home runs (twice what the average MLB player hits in an entire season) and blasting his way into one record book listing after another. Among the landmark achievements during Barry’s record-setting 2001 were a pair of six-game home run streaks reroute to his career and Major League high of 73 (Bonds 700 Home Run Club on MLB.com). 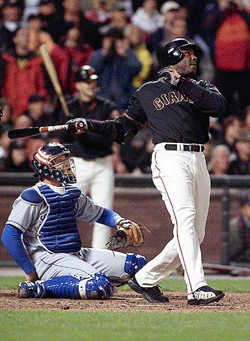 Just to prove he hadn’t lost his swing, Bonds went on to hit at least one home 8 games in a row in April of 2004. Other records that will not soon be bested are his seven MVP awards (1990, 1992–93, 2001–04), 449 home runs against different pitchers, consecutive number of seasons with 30 or more home runs (13 from 1992-2004). Single season slugging percentage (.863) in 2001, World Series slugging percentage (1.295) in 2002, most home runs in a single post-season (8) in 2002, consecutive seasons with .600 slugging percentage or higher (8), 1998–2005, full season on-base percentage (.609) in 2004, walks (232) and intentional walks in a single season (120) in 2004. 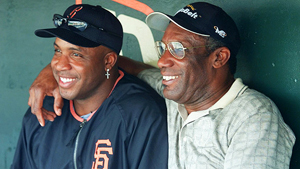 But the record he treasures the most is the one that he shares with his father Bobby Bonds: both had five seasons in which they tallied 30 home runs and 30 stolen bases, making them the only father-son members of the 30-30 club.